Catalonia has won Blanes Golden Cup for the fourth time after beating Italy in the great final 4 - 0. Two goals in each half has given the victory to the team of Jordi Camps. With this triumph, Catalonia show their strengh and win a CIRH's recognized tournament. The match started with both teams playing well and Joan Feixas scored the first goal (minute 6) with a great mid-distance shot. Jordi Carbó increased the distance scoring the second catalan goal, seven minutes before the half time. Ten seconds after the beginning, David Cáceres scored the 3-0 and Roger Rocasalbas closed the final scoreboard (4-0) 10 minutes before the end. Catalonia: Jaume Llaverola, Joan Manel Grasas, Edu Fernández, Joan Feixas i David Cáceres - Jordi Carbó, Roger Rocasalbas, Xavi Lladó and Francesc Gil. Italy: Giovanni Fontana, Giovanni Zen, Juan Luis Travasino, Mattia Cocco i Massimo Tataranni - Domenico Illuzzi, Davide Motaran, Enrico Giaretta, Antonio D'Agostino and Andrea Ortogni (ps). Referees: Antonio Gómez and Luis Delfa. Blue acumulative card: Grasas, Gil, Fernández and Lladó (Catalonia) - Cocco ans Tattarani (Italy). Red card: Tattarani (Italy). Catalonia has won Blanes Golden Cup for the third time in a row after beating Germany 3 - 1. 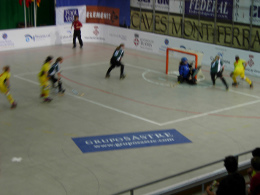 Catalans have won the three matches played, showing the high level of Catalan rink hockey, and beating the last two European Champions. Emma Corominas scored first goal with a mid-distance shot and Paula Torner scored 2-0 with a penalty shot. In the second half, Geismann did the 2 a 1 but Anna Gil scored the third Catalan goal for a brilliant Catalan play in the competition. Three participations, three victories. Germany: Christina Klein, Nicole Paczia, Anne-Marie Sesterhenn, Laura La Rocca i Beata Geismann - Josy Strunden, Gina Behnke. 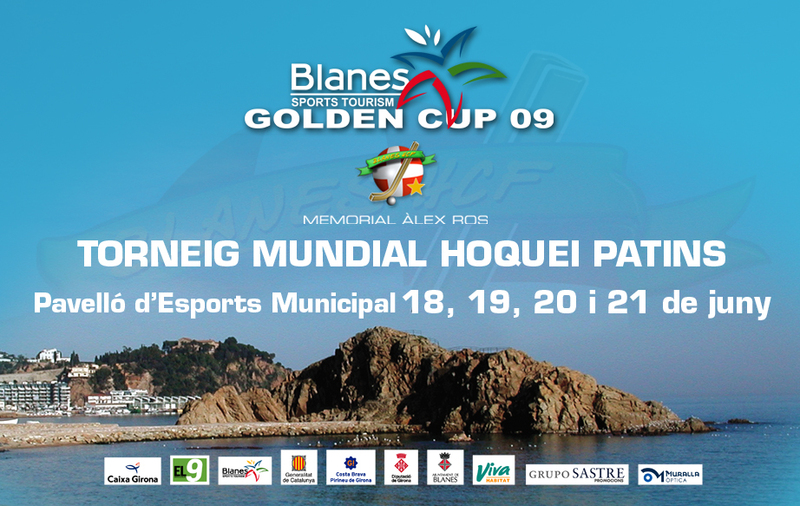 Viva Habitat Blanes finished in 3r place of Blanes Golden Cup-Memorial Alex Ros after beating France 7 - 4. The match started really leveled with the first goal of french player Furstenberger, and two goals scored by "Jepi" Selva and Kimi Ridaura for 2-1. Henry equalled the match (2-2) but then Viva Habitat Blanes got scored 3 goals arriving to the halftime with 5-2 in the scoreboard. In the second half Henry scored twice and reduced the gap (5-4). Viva Habitat Blanes played their best hockey then and Rodríguez and Benito decided the match and the third place of Blanes Golden Cup 2009. Viva Habitat Blanes: Ernest Freixes, Ramon Benito, Kimi Ridaura, Xevi Armengol, Jepi Selva, - Dani Rodríguez i David Plaza. France: Nicolas Guillen, Sébastien Furstenberger, Guirec Henry, Guilhem Lesca, Anthony Weber, - Kevin Guilbert, Igor Tarassioux, Loïc Le Menn i Olivier Gelebart (ps). Referees: Josep Gómez and Marc Soler. Blue card: Lesca and Tarassioux (France). France beat Viva Habitat Blanes 8 - 2 in an easy match. Now they keep waiting the unique chance to win the title: if Germany beat Catalonia exactly 4-2. Not easy, but not impossible. Viva Habitat Blanes: Virginia Díaz, Noemí Dulsat, Ester Artigas, Odette García, Marina Serra - Anna Armero, Judith Barranco, Paula Segura, Patricia Suárez i Txell Rubio (ps). France: Flora Michoud-Godard, Julie Lafourcade, Sandra Drouhet, Adeline Leborgne, Cindy Laurent - Malvina Fort, Louisiane Corbin, Emilie Couderc i Angela Rodríguez (ps). Referees: Gerard Gorina and Lluïsa Pérez. Blue card: García (Blane). Angola has got the fifth place after beating Austria 11 - 3. Austrian players have scored first (0-2) but players of Angola have showed again the good hockey played with France and Catalonia and have won the match scoring 11 goals. Austria has been fighting till the 3-3 but then Angola have played better. Angola: Henda Leite, Kirro, Rui André Gomes, Toy Adão, André Centeno, - Coxe, Joy, João Pinto, Zé das Botas, Mamikua i Mito (ps). Austria: Marco Wagner, Michael Schwendinger, Joachim Mohr, Manuel Parfant, Thomas Haller, - , David Huber, Martin Laritz, Thomas Kessler i Roman Mohr (ps). Referees: Xavier Galán and Aleix Gorina. Blue card: Kessler (Austria). 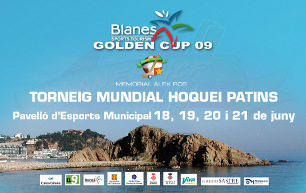 Blanes Golden Cup 2009 is played from June 18 to 21 in the pavelló municipal de Blanes.